Needham’s Department of Public Works (DPW) is now an official co-sponsor of the GO GREEN Needham Expo on Saturday, November 10 from 10am to 4pm at Needham Town Hall. To see a full list of participants, click here. Hope to see you there! It makes sense that the DPW is now co-sponsoring the GO GREEN Needham Expo. As the department responsible for the town’s asset management and preserving infrastructure to ensure the health, welfare, and safety of all of Needham’s residents, promoting sustainability is among its top priorities. The DPW oversees the Recycling & Transfer Station, which manages waste and disposal services for the Town of Needham. It also cares for all the public shade trees on roadway layouts, parkland, and school properties through its Parks and Forestry Division. The next time you’re at the Ridge Hill Reservation on one of the trails enjoying the 352-acres of natural wetlands, forest, and meadows, direct your grateful thoughts toward the DPW’s Parks and Forestry Division. Through the DPW’s Water, Sewer, and Drain Division, the Town of Needham is pleased to offer residents an opportunity to purchase Rain Barrels and Soil Moisture Sensors at the Town’s cost. The Town is introducing this program to encourage residents to be more contentious on water conservation and also to help mitigate pollution in the water supplies and save money on rising water bills. Water usage can increase as much as 60% during the extended summer season from outdoor watering needs such as watering gardens, lawns, and washing cars. Rain barrels offset that increase; saving homeowner’s money and helping the community manage water supplies. Rain barrels also reduce runoff. In the Charles River Watershed, runoff can harm existing wetlands, ponds and the streams because storm water systems discharge polluted runoff. The Town also offers free water-efficiency kits for distribution to our residents. The kits include showerheads, aerators, toilet tank dams and leak-detecting dye tabs. Want help figuring out the safest bike routes for commuting? The DPW’s Engineering Division offers a Needham Bike Ways Map to help. 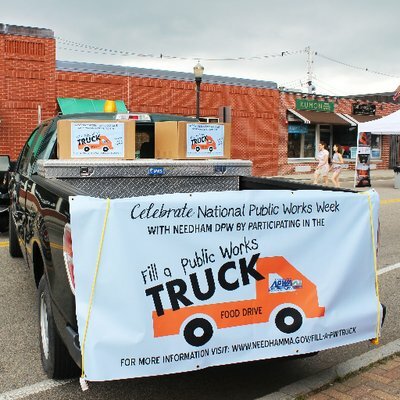 There is so much more the DPW does to help Needham with issues of sustainability. Want to learn more about how the DPW can help you be a little greener? Visit us at the GO GREEN Needham Expo.